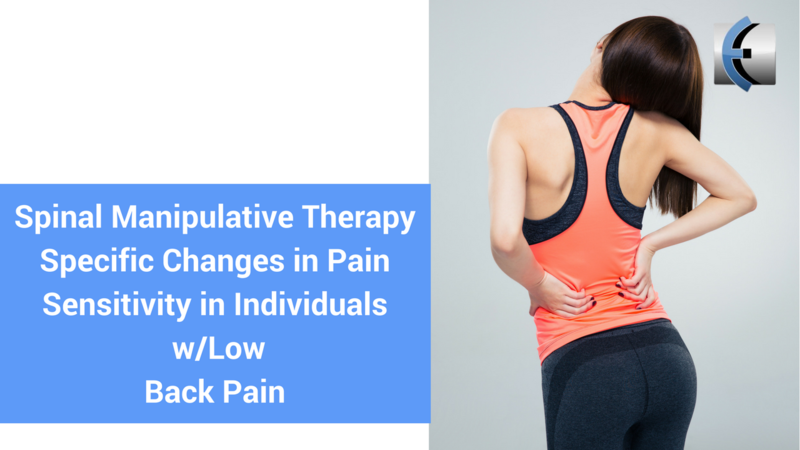 Since LBP is a heterogenous condition and the pathoanatomical basis is largely unidentifiable, identifying subgroups of individuals with LBP who are likely to benefit from a specific intervention is a research priority. The primary purpose of this study was to consider a potential mechanism of SMT by determining the efficacy of SMT on pain sensitivity. The current study was designed to determine if the reduction in pain sensitivity is specific to SMT or expectation of receiving SMT. Subjects were a sample of convenience from University of Florida b/w ages of 18-60, currently experiencing LBP > 4/10 at its worst over the past 24 hours. Exclusion criteria included no symptoms below knee, potential non-MSK causes of LBP including unexplained weight loss > 10 lbs, bowel/bladder dysfunction, surgery to low back in past 6 months, DM, chronic pain unrelated to LBP, fracture as cause of LBP, and pregnancy. Subjects were divided into 1 of 4 groups: an SMT group, a placebo SMT group, an enhanced placebo SMT group, and a no-treatment control group. Subjects in the standard placebo SMT group received a novel intervention that was supposed to mimic traditional SMT but differ biomechanically. After the pt was log-rolled towards the examiner, they were returned to the supine position instead of maintained in a contralateral sidebend and rotated position as in the studied SMT technique. A thrust was then performed to the contralateral ASIS into the treatment table. Although load was applied to the spine with the placebo SMT technique, the authors argue that it was necessary in order to create a credible comparison to traditional SMT. Subjects in the enhanced placebo SMT group received the same treatment and were also informed that they would be receiving either a studied SMT technique or a placebo intervention. However, they were also told that "the MT technique you will receive has been shown to significantly reduce low back pain in some people." The specificity of this finding to SMT and not placebo SMT suggests a mechanism beyond the expectation of receiving SMT. Discuss in our new chat room!